Audiogon had the pleasure of meeting Member Ryedady (Ryan W.) at Rocky Mountain Audio Fest last month and discovered he’s just a great example of the next generation of audio enthusiasts who are taking the time to learn about the industry. RYAN: I think a true audiophile is almost obsessive, were constantly searching for the ultimate in high HiFi playback were also willing to spend more than we should or are wives want us to in order to achieve this goal. Whether you’re a blue color or white color audio-nerd, regardless of price you can rest assured a true audiophiles speakers are the correct distance off the walls, the proper toe in, and leveled, your signal cables are away from your power cables etc.. The casual listener regardless of the cost of his system, will have no concept of proper speaker placement, cabling or setup. They will be uncaring about maximizing the full potential of their system (to them it sounds “fine”)ie.. speakers up against walls or stuck in corners bloating the mid bass and washing out the mids and highs, using the loudness controls with bass and treble cranked all the way up, 20 gauge 1970’s oxidized wiring all tangled into their power cords, etc..
AGON: What was the first item you bought that signaled you’d crossed the line into being an audiophile? RYAN: My Favorite piece of gear would be my speakers, Monitor Audio Gold Reference 60. I actually sold them to a friend and went thru several other pairs over the course of two years. He recently “upgraded” and I bought the Golds back and have just been amazed with them it doesn’t matter what other gear I swap in the chain I always like the sound of my system with those speakers in it. AGON: Do you prefer one music format over another? Why? RYAN: This is a sensitive question, I just got back from Rocky Mountain Audio Fest and after 3 days of listening to mellow jazz I thought I was going to go postal. I would try and get them to play some rock that I love and grew up with and the guys would hear 30 seconds before turning it off and saying, “ah man you got to here the quality of this recording – it sounds so much better.” Then, of course, the jazz would be back on. I admit the recordings are far superior, but there comes a point when you’re listening to something because it was recorded well instead of just listening to something because its enjoyable and fun to listen to. I got caught up in the whole listening to the stereo instead of the music thing for a while, too. Finally, after some advice from a seasoned 70 year old rocker audiophile friend, I took a step back and “downgraded” my uber expensive amp and pre amp and went with something less resolving and “sterile.” My system is now warm, lush, musical and ultimately just plain enjoyable. Now I just enjoy the music, and hey, if it’s a good recording then even better! If not, hey who cares? Let’s just ROCK!!! AGON: What advice can you give those who are new to high-end sound? RYAN: You don’t have to be wealthy or go broke to have a killer system. 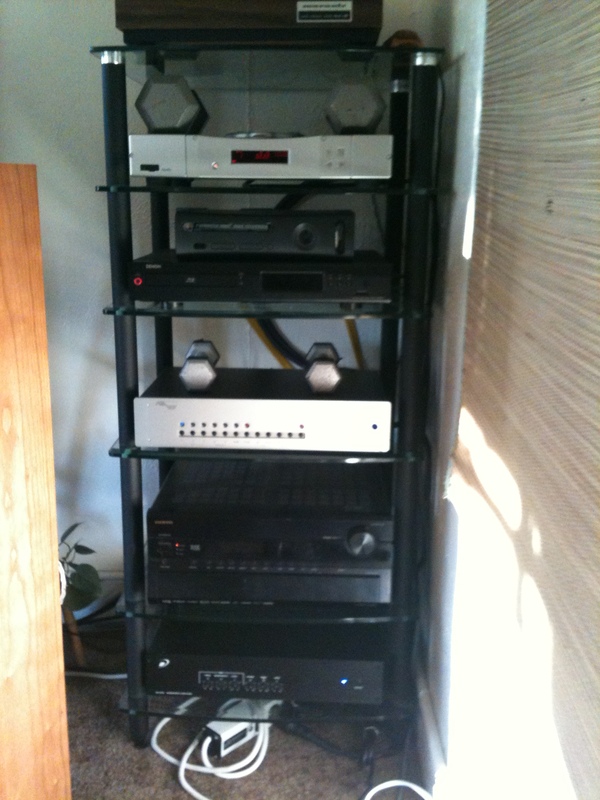 My whole system was less than $8000. There is a wealth of info on the net, do the research, don’t be afraid to join forums and ask questions. Shop smart. Put your money where it counts the most and remember, a well-pieced together and properly set-up budget system can blow away a system costing three times as much. Don’t be afraid to buy used gear! Most of the stuff I have was super expensive when it was new and was built to last. RYAN: I love Jimi Hendrix on vinyl, nothing makes those guitars crunch like vinyl on tubes. And you have to love pink Floyd – just excellently mixed and put together. My favorite genre, though, is late 80’s industrial music, Front 242, Skinny Puppy, OLD Ministry (none of the newer speed metal stuff). Honestly I haven’t been to a ton of shows. Though I’ve seen some good ones, I was really blown away by Puddle of Mud – those guys FN rock live! I went out and bought the album after the show and thought it sounded horrible, too bad they couldn’t catch the feel of there live performance on the album; I guess the studio is to blame there. RYAN: Pair of MBL 101E MKII speakers with the matching MBL gear, a big stack of records, studio master tapes and enough top shelf scotch to kill a gaggle of Scotsmen..
We love showing off your interesting or awesome systems! 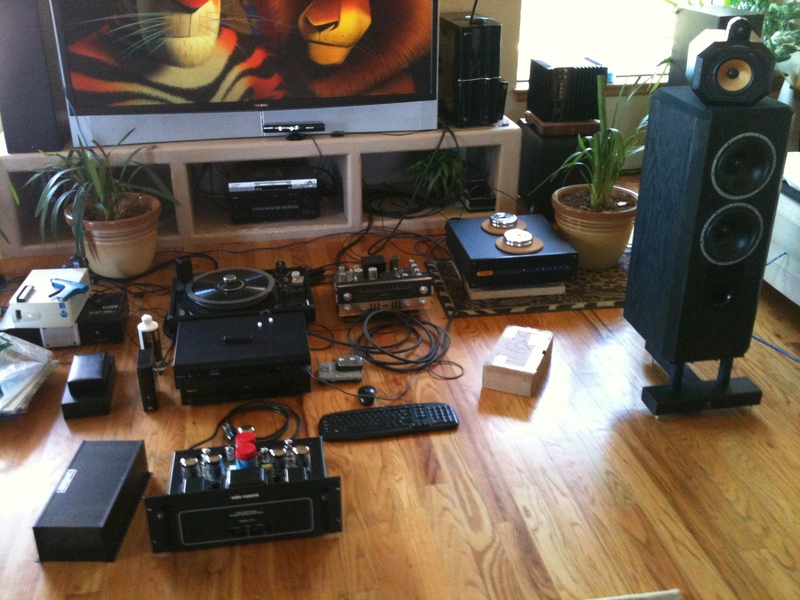 If you have a listening room or would like to be a Featured Audiophile, submit your system here! Hey, great system here !